More than a day care. Our Moonbeams classroom is the older toddler classroom. The Moonbeam room is indeed a very special place. For some children, it is their first group experience in a setting away from home. 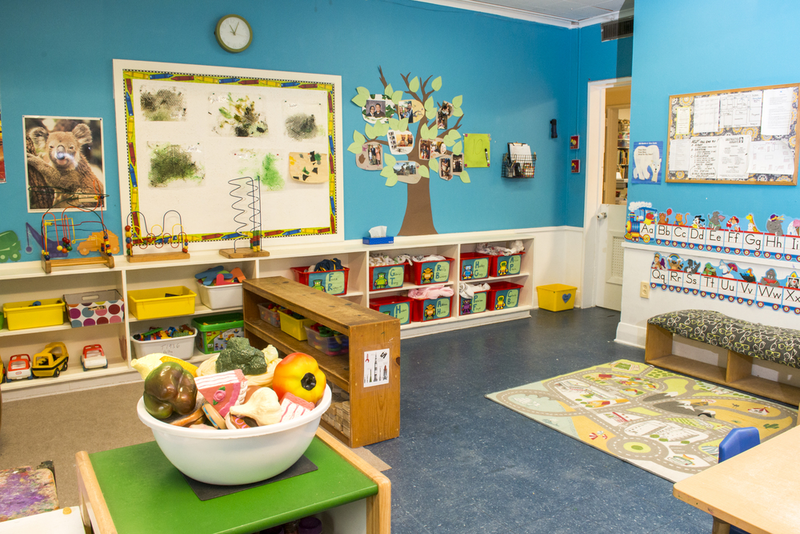 In our classroom, a great portion of our day centers around creating a classroom environment in which the children feel secure and connected in a loving place that is an extension of their homes. One of the most important ways in which we create this haven is through fostering a strong and constant home-school partnership. Through every part of our day, we facilitate social interactions between children. In this important time for language development, teachers support youngsters as they learn to use language for a variety of reasons, including sharing ideas, listening to each other, and taking turns. Teachers model appropriate language such as, "Can I play?" or "Do you want to play a game with me?" When conflicts do arise, and they inevitably do, teachers walk children through the steps of adult-assisted problem solving. Moonbeams learn to ask, for example, "Are you okay? What will make you feel better? It sounds like you are too sad to talk right now. We'll talk later." It is important to us that we validate children's feelings, whether they be positive or negative. Just as we celebrate and acknowledge feelings of joy and pride, we encourage children to bring feelings of anger and fear out in the open as well. In such an environment, they learn how to take care of one another and know that they in turn are going to receive care. We support the individual child's experience and interests by providing ever-changing and evolving centers that revolve around sensory experiences, dramatic play, pre-math, art, small and gross motor skills and pre-language development. You will be hard pressed to find a time when there is not a teacher on the floor reading a book and surrounded by friends. By allowing children to easily rotate through to different areas of the room, we validate their choices and support their interests. Moonbeams are approximately 20 to 30 months. There is a student to teacher ratio of 10 to 2.